A new affordable housing complex in the Bay Area aims to alter the economic fortunes of its community. 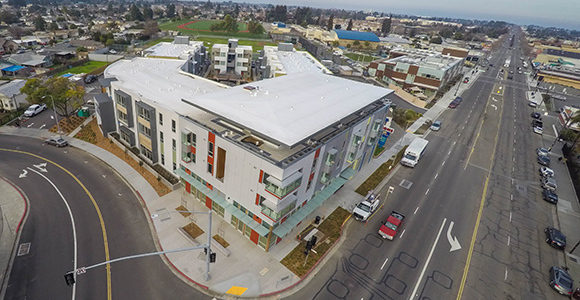 Ashland Place, located in an unincorporated area of Alameda County, not only provides housing for low-income families and young adults at-risk for homelessness, but it also includes a retail component that the developers hope will help to revitalize the local economy. Developed by the Resources for Community Development (RCD), Ashland Place is an 85-unit complex for low-income families, with 15 of the units designated for the at-risk young adults, 18-24. Alameda County partnered with RCD by providing some of the last available Redevelopment Agency Funds. As in the rest of the Bay Area, housing costs continue to increase, pushing out middle- to low-income residents who grew up and/or work in the area. A 2014 California Housing Partnership Corporation report estimated that Alameda County needs 58,680 units to accommodate its low- and very low-income residents. But what sets Ashland Place apart is that it will be a catalyst for economic development in the immediate neighborhood because it also contains 2,000 square feet of retail space that will not only provide additional commerce in the neighborhood, but jobs as well. Eileen Dalton, director of the Economic and Civic Development Department for Alameda County explained the importance of developments such as Ashland Place to the neighborhood: “The area had been bypassed by public investment. So this was one of the ways we felt we could provide some catalyst to the community by developing cooperatively with the public agencies we’re partners with.” She added that county is currently negotiating with a non-profit to build their new headquarters in the neighborhood. To qualify for Ashland Place, residents’ household income cannot exceed 50 percent of the area median income, which for a family of four in the area is $46,500. Fifteen units will be available to young adults at risk for homelessness through First Place for Youth, a program that offers support to youth who may not have strong family support, or who have just left the foster care system or a group home. Ashland Place is also adjacent to the newly opened REACH Ashland Youth Center, which provides services ranging from child care to career development for area residents. Ashland Place is a good example of how local governments can use affordable housing funding to address specific regional needs in struggling areas. It also is a step toward the California Economic Summit’s 2016 Roadmap to Shared Prosperity goal of creating one million new housing units over the next decade to balance the housing supply with demand. And to Dalton, the complex became an important investment into a community where "nothing was really more than one or two stories." “Now you drive down the street and you feel like you’re somewhere," said Dalton. "It’s really kind of an amazing difference."